The improvisation workshops are extensions of the technical classes. The often playful and open forms help the dancer to break through fixed patterns, and be surprised and pushed forward by the events in the group. The necessary alertness sharpens the senses and teaches how to deal with a group. The ‘Improvisation Technologies’ (as developed by William Forsythe) is a method that is mostly spatially and conceptually oriented (a.o. on the basis of Laban’s system of body directions). Through techniques of deconstruction and recombination, parts of the body are isolated and movement phrases are developed for them. The relation between improvised material and fixed movement phrases, both in the creation process as in a performance situation, are an important field of research. ‘Passing Through’ has been developed by David Zambrano and is taught by himself and others he has trained. Zambrano’s approach offers a more organic, intuitive and impulsive method to create movement patterns. The focus is on the development of a sensorial sensitivity: which relations can be developed with the ‘world’ (space, people) around you. Movement is considered as interaction with that world. In the workshop ‘Contact Improvisation’ students are confronted with the pure basis of dancing together, the contact between two or more bodies. The dancers learn to recognise, discern different types of shared weight, and to work with them. An individual dancer must learn to release his grip and to surrender to the momentum of the movement with a partner. In the 2nd year, there is an additional workshop improvisation, focusing on improvisation as research tool and as performance tool for spontaneous composing. Composition is divided in several workshops given by different teachers. In the 1st year, the focus is on a general introduction of the toolbox. In the 2nd year, there are three different workshops. One starts from the compositional methods of Anne Teresa De Keersmaeker, as explained in the book series ‘A choreographer’s score’. Students study the principles and work on applying them to their own ideas and materials. A second workshop presents a very different approach coming from different principles in music composition. 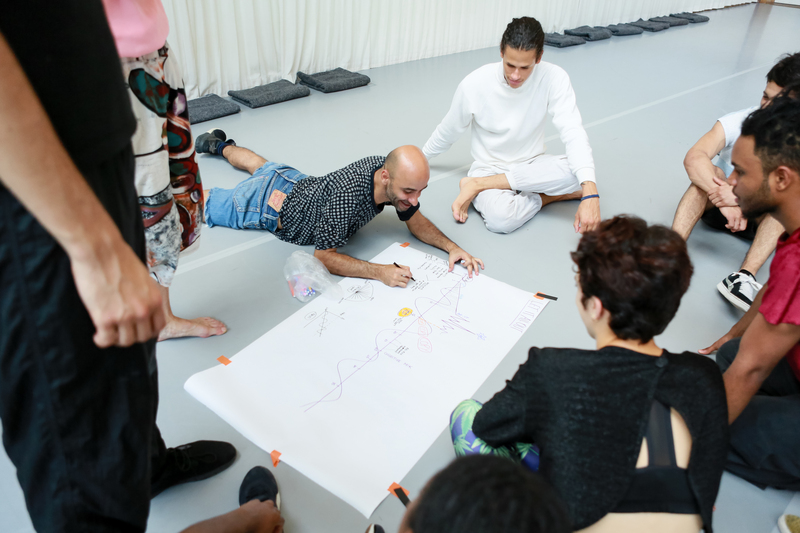 A third workshop digs deeper into the compositional methods of specific artists such as Anne Teresa De Keersmaeker, William Forsythe, Jonathan Burrows and Xavier Le Roy. In the 3rd year, the focus is on the creation of group work by the students themselves, starting from scores and materials handed over by choreographers. - to provide a creative and stimulating context to develop and discuss the student’s ideas on composition. By working with a choreographer on a creation, students are confronted in the most direct way with the thinking and working methods of professional artists. In most cases, such processes also create a lot of space for the individual contributions of the participating students – the ‘authoritarian’ model of authorship has become a rarity in the professional field, and students show little enthusiasm for taking up a mere ‘executing’ role. In the 2nd year, the workshop with invited choreographer focuses on composition and methodologies (see composition). In the 3rd year, invited choreographers make a short piece with the students, which is shown during a tour in theatres in Belgium. This is the final work of the Training Cycle. The study of repertoire is a confrontation with the vocabulary of a specific artist. The aim is to offer insight into how a work is constructed and structured, not through analysis from a distance but by putting it into practice. In some workshops, the focus is on a clear and correct interpretation; in others, new versions are made based on the basic framework of the original. Both approaches challenge the students to express themselves in a strong, highly developed and imaginative vocabulary. The repertoire workshops stimulate the choreographic thinking of the students, introduce new ways to generate and structure material, to handle patterns, complex sequences, ideas of space, multitasking and dancing in groups. The repertoire focuses on the main artistic cornerstones of the P.A.R.T.S. program: Anne Teresa De Keersmaeker, Trisha Brown, William Forsythe and Pina Bausch. The repertoire of Anne Teresa De Keersmaeker is featured in the 1st and 3rd year. Both classic and more recent work can be tackled – in the past years students have been working on Rosas danst Rosas (1984), Rain (2001) and Drumming (1998), but also Quatuor N°4 Bartok (1984), Die Grosse Füge (1992), Achterland (1990), The Song (2009) and Zeitung (2008). Trisha Brown’s work is studied in the 2nd and 3rd year. In recent years, students have worked on Solo Olos (1976), Opal Loop (1980) and fragments of the early works (1966-1979). William Forsythe’s work is studied in the 3rd year. In the past, the workshop treated pieces such as Vile Parody of Address (1988), The Scott Work (19986) and Alien:a(c)tion (1992). Pina Bausch’s work is studied in the 2nd year, in 2015 this will be fragments of Nelken and other pieces.